The periodic atomic table element IRON and the North/South Pole magnetic field interaction with iron in human BLOOD determines the course of history and social evolution. The ferrous oxide IRON architecture of the FermiLAB building, WILSON HALL, is a reminder of President Woodrow Wilson, year 1914, and the start of World War 1. Thus we have a mirror ..... an mental inspiration to REFLECT upon life, existence, and various events that have occured in history. What can we learn using string theory and the modern Margaret Mead atomic nuclear family ... atomic social anthopology conflict theory? Let's reflect upon the cryptic message words "WILSON HALL'" and periodic atomic table element Fe = Ferrous oxide IRON atom at the RD location for Fe = FermiLAB. FermiLAB CLUE suggests the IRON atomic symbol Fe is important factor in both tragic events .... about 100 years apart using the regular TIMELINE of string theory. 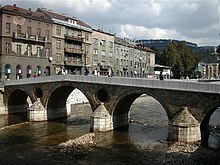 The Latin Bridge in Sarajevo was the site of the assassination. In telecommunication networks, a bridge is a product that connects a local area network ... In bridging networks, computer or node addresses have no specific ... data frame from one network to the next network along thecommunications path. Thus we see the message ..... a LANGUAGE communications bridge problem among the human bio-computers in Europe in year 1914. Bridge Communications made computer network bridges, routers, and communications servers. They specialized in inter-connecting different kinds of networks. Above .... we have seen an overview of various CLUES that are empircal data for string theorists ...... to explain the fabric of a few EVENTs within the EARTH LAB mathematical-physics continuum which includes the atomic human side. The string spans 100 years of information flow. During those 100 years the information systems had an occasional expression in tangible visible EVENTS useful for a string theory database. Let's repeat the above ..... in different words. Use the FermILAB building architecture of Wilson HALL and the picture signal "the reflection on the water pond" --> the subliminal MIND suggestion by the photographer to "reflect ..ponder ... and have your thoughts travel back in time ...to water....author H.G. (water) WELLS and the book "The TIME MACHINE" and the "InVISIBLE Man ( atomic English language Manuscript) ". Take the recent EVENT (Cole Hall year 2008) and use the suggestion to "reflect and ponder" about Wilson Hall, FermiLAB and Nature's systems architecture. we look at Nature's clue ---> FermiLAB with Ferrous Oxide and Illinois Higway 56. Thus we travel in TIME...using the brain processor and the symbolic TIME MACHINE ...specifically, the February FERROUS OXIDE atomic Time Machine of Nature. nation of Architecture Ferrous oxide tria(l)..
.....14 .............................Fe --> 14 February ST. Valence Day at Northern Illinois University . ..... Iron communications bridge collapse I-35W in ST. Paul (Dirac) with TALLAHASSEE and the Tall message regarding the Hierarchy Problem in modern Margaret Mead atomic nuclear family ... regarding atomic social sciences and Nature's music message --> ZZ Top is ignored. Thus string theorists have 2 major data sets of proper nouns, adjective, dates, geography locations , news event that they can work with .. ..... establishing math mappings functions etc. The data sets are the year 1914 TIME Period and the year 2008 TIME periods mentioned above. Year 1914 and Ferdinand are like DATA SET labels ....... but include the other info mentioned. year 2008 and Cole HALL is the DATA SET name for several related happenings. Thus we see the IRON WAR calender .... the internals of TIME ... the TIME CLOCK of iron ...with the iron gears . --> EARTH IRON CORE and its iron clock (large scale). Thus we have a few pieces to an interesting puzzle ...... ... the IRON architecture of existence of LIFE on EARTH . What would ALICE see ...thru the LOOKING GLASS ..... using the FermiLAB glass windows?. This page contains a single entry by Herb Zinser published on February 24, 2013 6:06 AM.